You may purchase the book on-line, or you may order by mail. Click here for details. 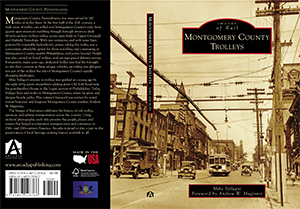 A sampling of the book's 214 photographs, along with shortened captions, have been georeferenced on the Montgomery County Trolleys Google Map. Click on a marker to view a photo and read a brief caption. Zoom all the way in to reveal markers hidden behind nearby ones, particularly in towns. Purchase the book, or borrow a copy from a library, to view all the photographs and read the complete captions. The photographs printed in the book are larger and sharper than the small preview images you'll find on this map. Follow this link to view the Google Map.